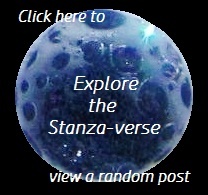 The Grand Scheme | What Rhymes with Stanza? In the grand scheme of things… hmm. To begin with, my place in the world is under the sun. That’s the grand scheme part. But where do I belong? I belong in the space where the currant bush that was given to me by my sister grows. I belong where I can watch the changing of the seasons on an ivy-covered wall. I belong where wildlife visitors are welcome to drop in (with some notable exceptions, i.e. rodents and wasps). I belong where I can share a red table, a blue chair and a quasi-green lawn with a white dog. The place where I feel most at home is — well, at home. But in the grander scheme, my thoughts and energy, and even these words I’m typing right now reach far beyond the expanse of greenery that surrounds my home. So for a glimpse of who I am, get a glimpse of who you are, and there you will find me, too. Unless you’re a rodent. Or a wasp. This entry was posted in Animalia, photo essay, Photography, weekly photo challenge and tagged belonging, currant, trees, weekly photo challenge, wildlife. Bookmark the permalink. Lovely selection of pics & I like your closing lines. I hardly ever see snakes here, but they’re harmless. What I should have added to the list was spiders, but outside of the house, if they leave me alone, I leave them alone. Although depending on how creepy they look, the definition of “leaving alone” can change. Yes, I am fortunate to have such a place. Thank you for commenting. What a lovely post and closing thought. And I don’t mean the one about the wasp. I guess I have, haven’t I. Found you there. And we’re having a blast. Yes, we are! 🙂 Thank you, Manja.